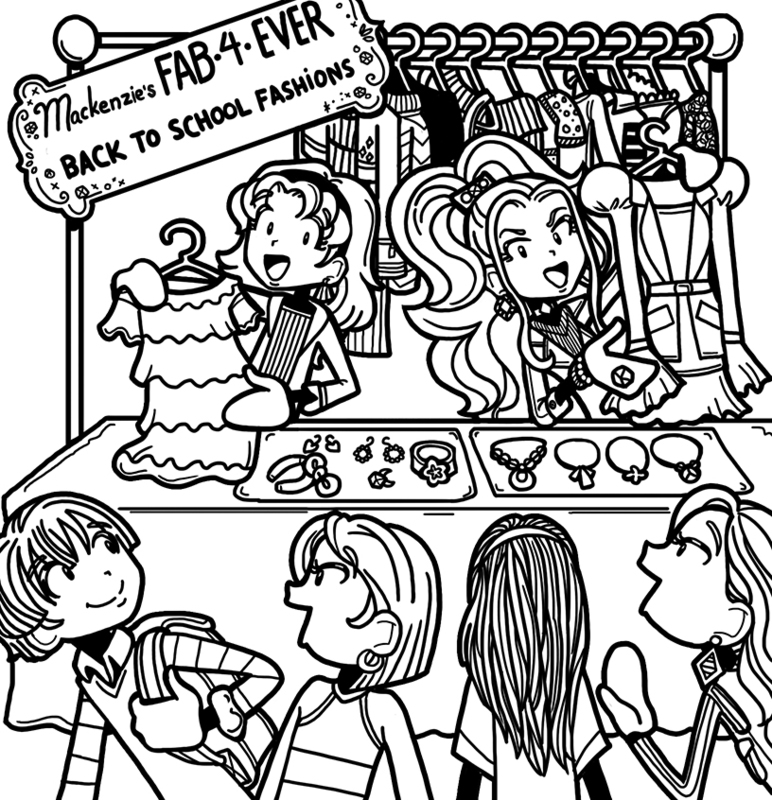 As you may remember, MacKenzie recently BEGGED me to help her promote her new back-to-school clothes business because she thinks I know how to influence the dorks at WCD. But then I realized she seemed pretty sincere, and she LOVES her Fab-4-Ever Fashions like my dad loves bugs. Equally important, helping her could be like signing a peace treaty…and I’m SO tired of the CCP wars! Have you heard of TOMS shoes? Every time someone buys a pair, they give a pair to someone in need. But they price the shoes high enough that they still make money on each sale. It’s a super smart marketing campaign. Shoes that feel good + feel good buying = a totally brilliant plan! This kind of marketing doesn’t work on most CCPs…because you need to have cash AND a conscience! I told MacKenzie she should target the dorks with money (not to be confused with dorks like me, whose parents bring rolled coins to cheap department stores for poorly made, off-brand clothes). Since dorks care, those kids would feel really good about buying some of her clothes AND helping kids less fortunate than them. Win-win! If you want to earn big money, you can’t sell to kids with a limited allowance. You have to tap the greatest resource available to us: our parents’ wallets! But they don’t just open those things every time you ask to buy something. Parents are SUPER protective of their wallets. It’s like they have several other tiny, green, flat children resting in there…and they guard them with their life! To get parents to buy stuff, you have to convince them they’re getting a lot for their money. The word “success” makes parents think of us growing up to be doctors and lawyers, which they love! And just like with the BOGO sale, she could raise the price on the dress so the parents only THINK they’re getting the school supplies for free. Most marketing people use celebrities to get us to buy stuff. They even give free clothes and shoes to movie stars and singers (like they need them!) because they know we’ll rush to the mall so we can fill our closets with things Katy Perry likes. But I have news for the misguided marketers out there: not all of us are trying to keep up with the Kardashians! In fact, a lot of us prefer NOT to look like everyone else. We want to let our inner dork shine through…OUR inner dork, not someone else’s! I told MacKenzie she should pick a few items of clothing and offer a list of ways to make them unique. For example, she could let kids choose their own words to put on cute T-Shirts. Or, she could let kids literally design their own outfit – choose the fabric, the color, and the style – and then make it for them. Sure, it’s time-consuming. But you can charge more for customized stuff. And remember those dorks with money? They’d be ALL over it! I know I told MacKenzie I didn’t want any credit for my ideas, but now I kind of want it, because I think they’re really good! What do you guys think? If you get to know her better, you might have a credit from her.